On Sale Now! Save 4% on the Graco Everest Pack 'n Play Playard, Mason by Graco at Baby Bouncers & Swings. MPN: 1946903. Hurry! Limited time offer. Offer valid only while supplies last. 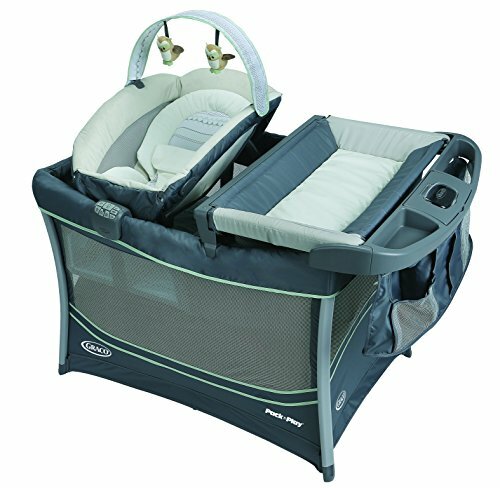 Graco's Pack 'n Play Playard Everest keeps baby's ultimate comfort in mind with a removable lounger that keeps baby by your side throughout the home. Graco's Pack 'n Play Playard Everest keeps baby's ultimate comfort in mind with a removable lounger that keeps baby by your side throughout the home. The cozy, portable lounger can fold to be easily transported from room to room, and includes calming vibration to help soothe your little one. Everest also has an extended use hideaway diaper changer for babies up to 30 lbs. Simply slide the changer to the side when not in use to provide maximum space for baby. Diaper changes are easy, too, with premium parent storage attached next to the hideaway changer to keep all of baby's necessities close. If you have any questions about this product by Graco, contact us by completing and submitting the form below. If you are looking for a specif part number, please include it with your message.